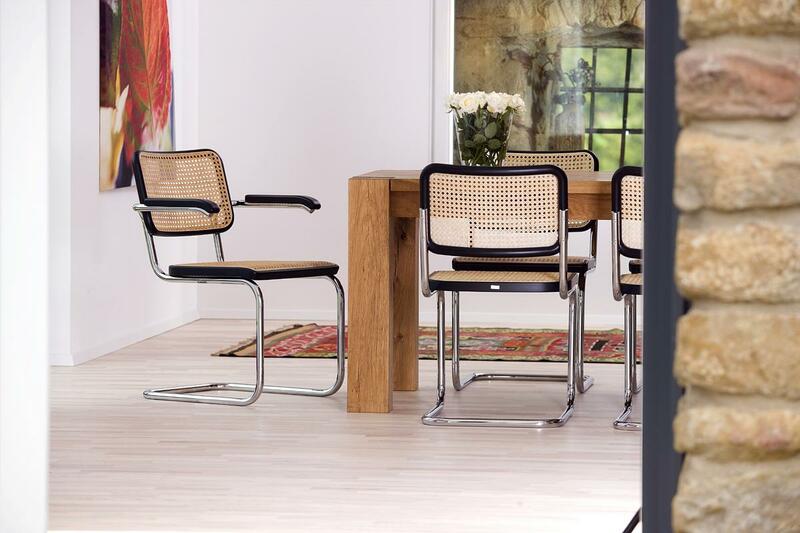 As one of the first of its kind the Thonet S 64 cantilever chair is now one of the genuine icons of modern design history. 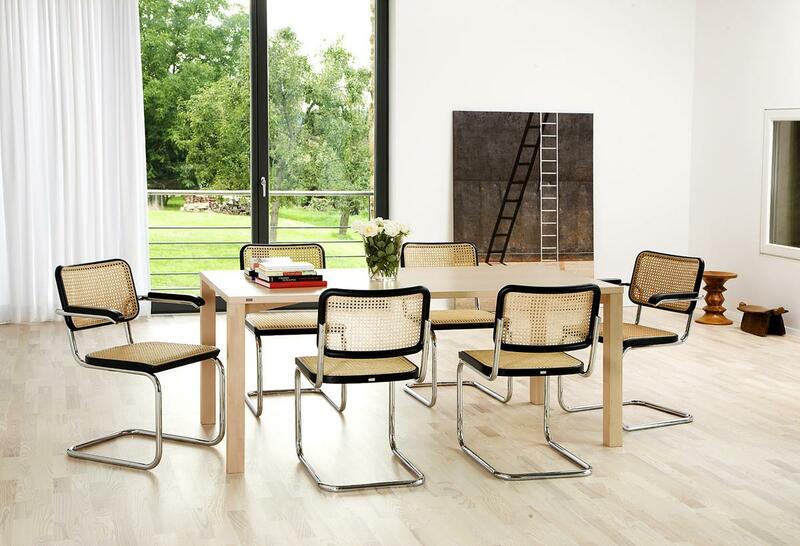 Although in production with Thonet since the early 1930s, the S 64 cantilever chair retains the spirit of the Bauhaus in its easy combination of functionality and frugal aesthetics, and continues to offer the same seating comfort with minimalist look it always has. 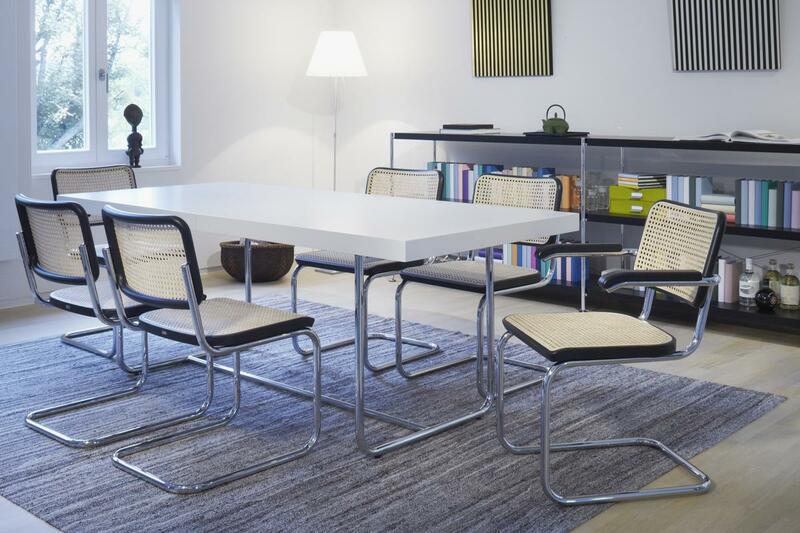 In addition to offering Marcel Breuer's creation with the classic cane seat Thonet also offer the S 64N with a synthetic mesh seat. 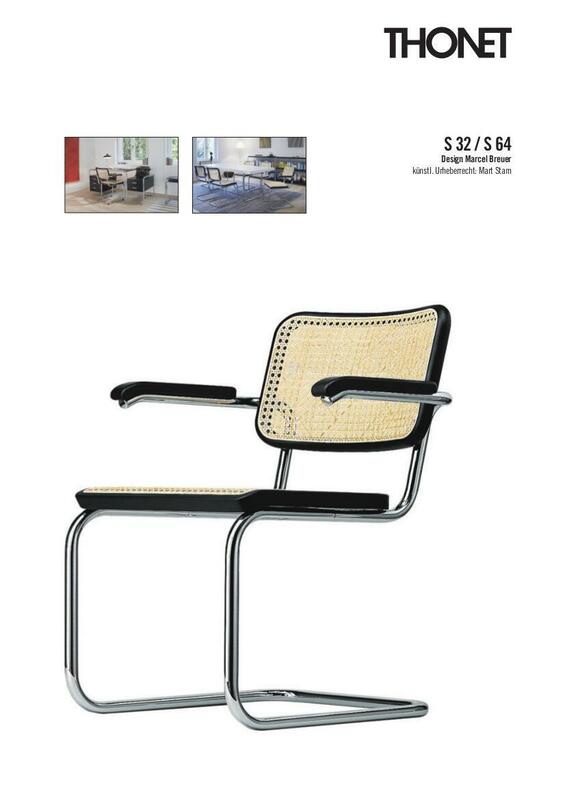 In addition Thonet produce the S 32, the same design, just without armrests. Functions & properties As seats are usually exposed to heavy use, there is a transparent, plastic mesh (supporting tissue) underneath the wickerwork in the seat. However, the chair can also be ordered without the supporting mesh. Care Natural materials need special attention. The wickerwork should be regularly moistened on the rough bottom / back, to maintain its elasticity - this is especially important in dry and/or air-conditioned rooms. Dryness over a long time making the natural material brittle and susceptible to cracking. Should the wickerwork start to lose threads these can be attached with an adhesive. Subjecting the chairs to point specific heavy loads must be avoided. Is it possible to retrofit felt glides? Is the S 64 also available without armrests? What is the supporting tissue? 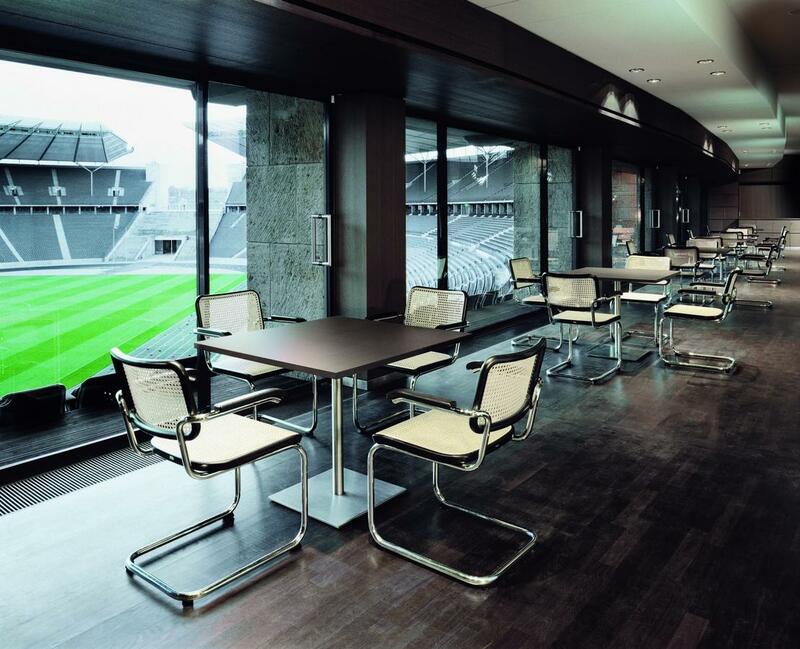 For chairs which are exposed to particularly heavy use, a transparent plastic mesh can be fitted under the wickerwork. The S 64 is however also available without the supporting tissue. The question as to who is the actual inventor of the cantilever chair, without question one of the most distinctive furniture designs of the modern age, remains controversial. 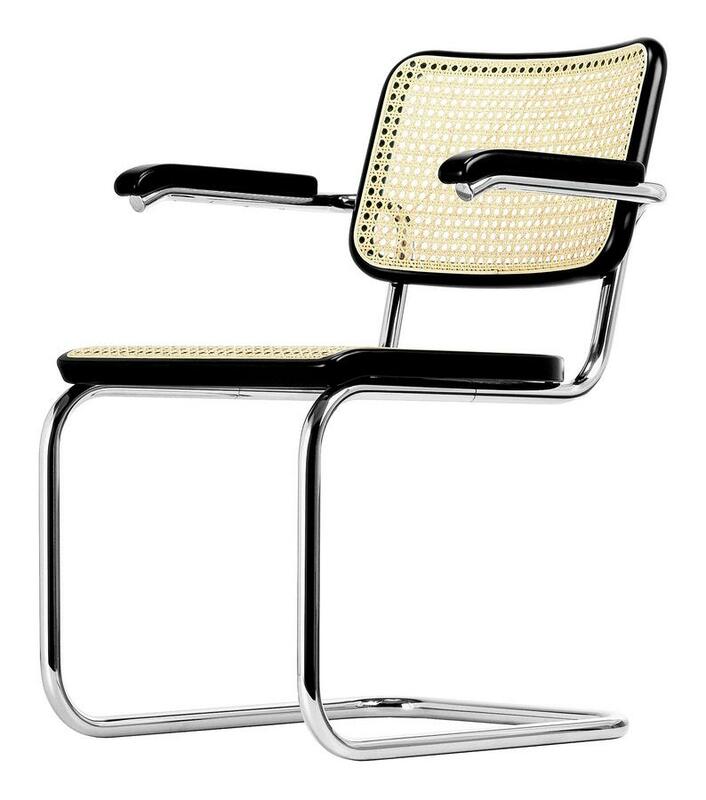 Although in 1932 the artistic authorship was awarded to the designer Mart Stam, Marcel Breuer was also directly, and unequivocally, involved in the development of cantilever chairs. 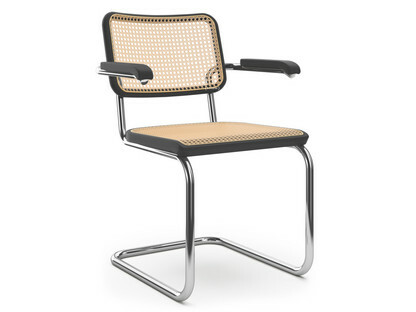 As early as 1925, the novel use of steel pipe could be seen Breuer's design of the Wassily Chair B3 albeit in a chair still conceived with hind legs. 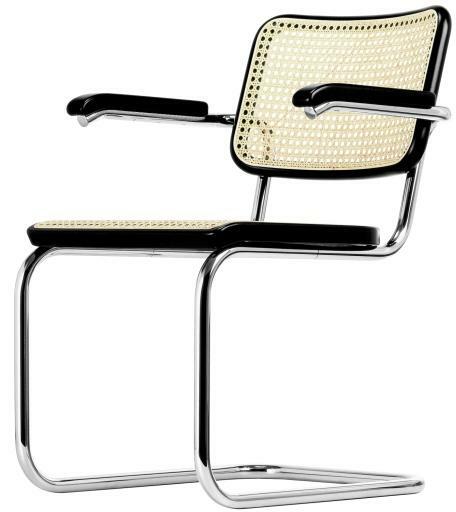 The tubular steel cantilever chair Thonet S 32 without armrests and the Thonet S 64 with armrests weren't developed by Breuer until the late twenties: so after Mart Stam and Ludwig Mies van der Rohe had presented their models of cantilever chairs at the Stuttgart exhibition "Die Wohnung". 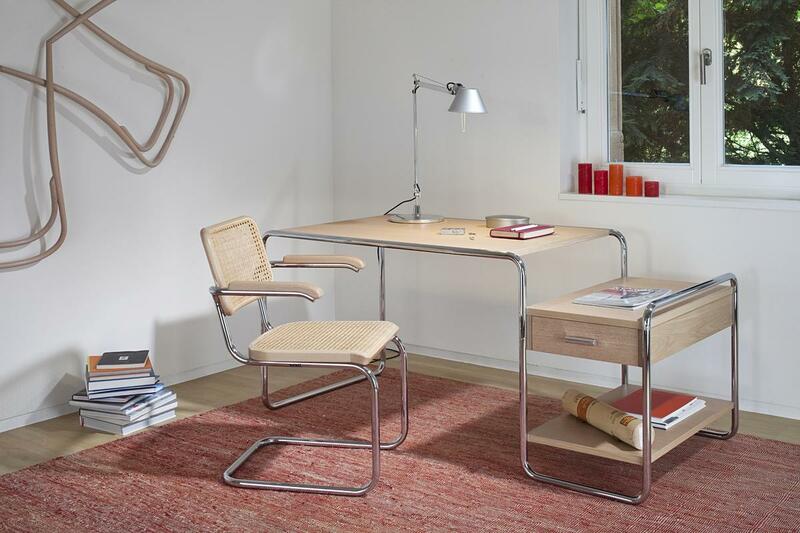 Breuer' S 32 and S 64 were produced from 1929-30 by Thonet and are also known as the Cesca chair. The design of the Thonet cantilever is, as with other models of his time, characterised by the cubist form of the steel tube construction; a construction which removes the need for the rear legs and thus creates makes the free-swinging character. Through the elasticity of the steel tube frame the Thonet S 64 remains flexible and resilient, responding to the movements of the user. In the spirit of the Bauhaus the cantilever combines functionality and economical aesthetics - combines comfort with a minimalist look. 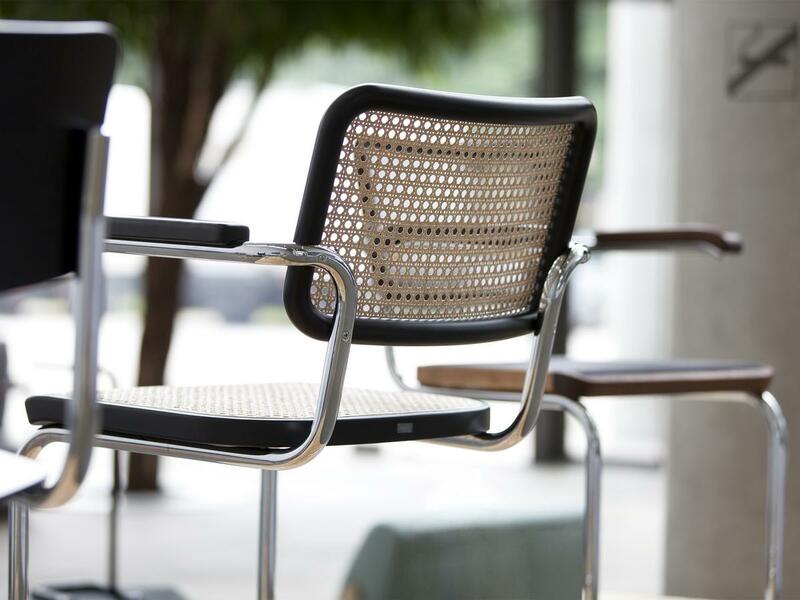 In contrast to other cantilever chairs Marcel Breuer combined the cantilever with a covering of woven wickerwork: an entirely new combination of contrasting materials which underscores and highlights the lightness of the design. 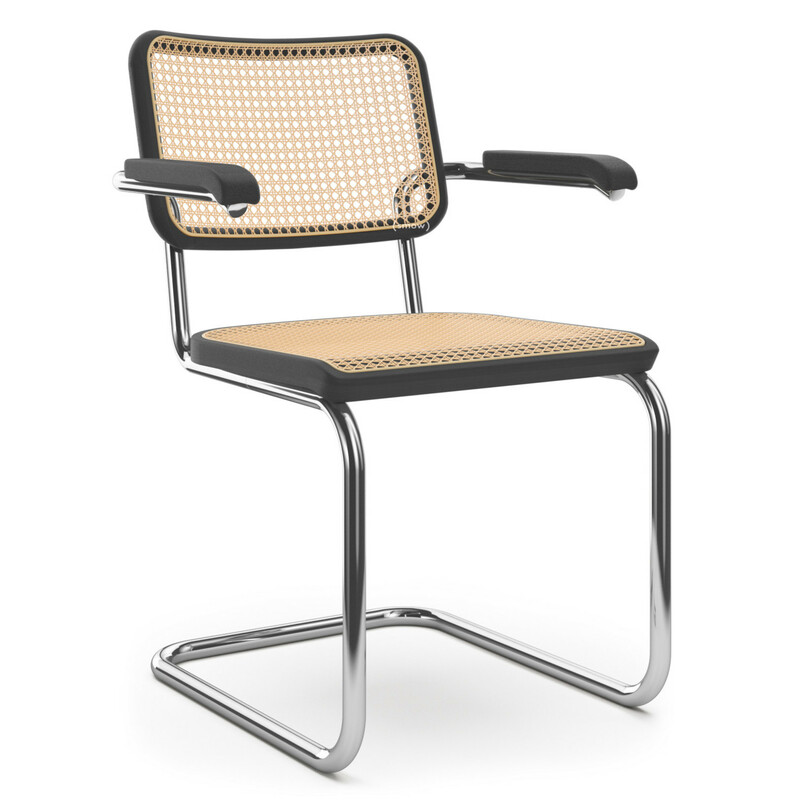 Marcel Breuer's classic S 64 cantilever chair is produced by Thonet at its production facility in Frankenberg / Eder, Germany, according to age old production techniques. There the cantilever frame is bent from an feathered precision steel tube, a material allows the resistance and so the free-swinging effect. 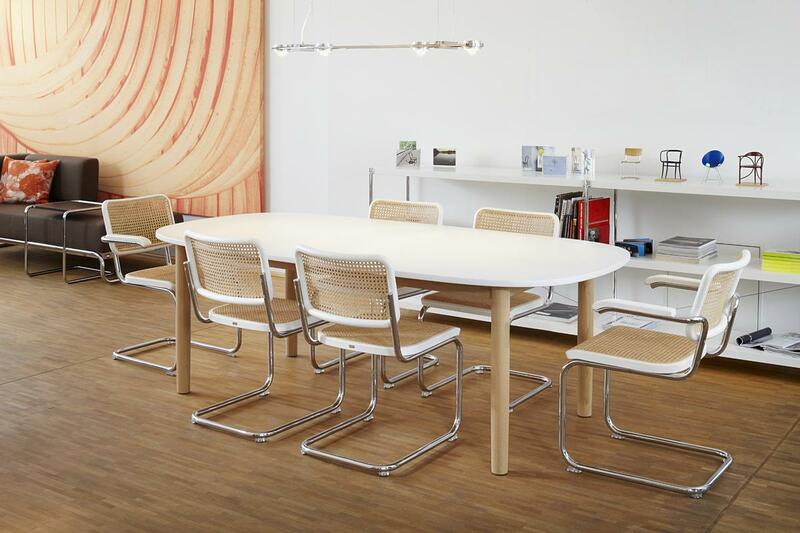 For the wood stained and painted components Thonet use beech from FSC or PEFC certificated forests. The wickerwork is made from rattan is tailored in Frankenberg by hand and inserted into the wood frame. Rattan has the advantage of being very strong and sturdy, but also flexible. In addition, rattan is a rapidly renewable resource, whose processing is ecologically sustainable. In order to stabilise the flexible cane a barely visible plastic mesh is placed under the cane. 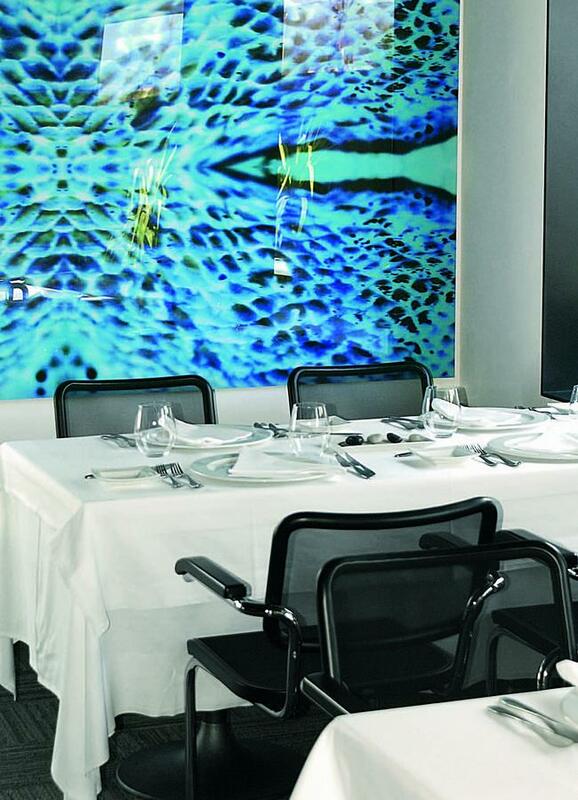 As an alternative to wickerwork Thonetalso offer the S 64 with a synthetic, semi-transparent, black netweave. 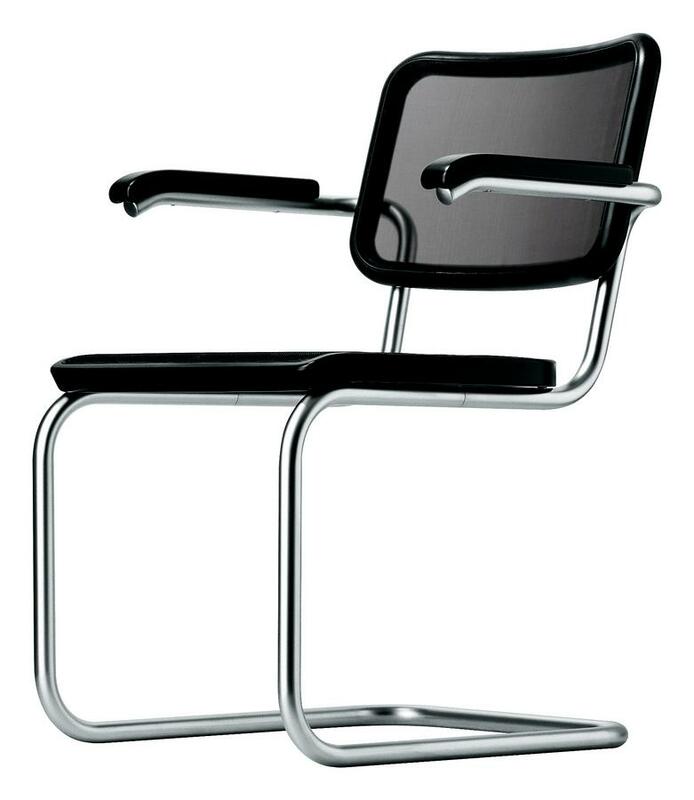 In 1925 Marcel Breuer presented at the Bauhaus his first tubular steel design, the Wassily Chair B3, before moving on in the following years to develop further furniture design classics, including the Thonet S 64. These designs formulated a new and functionalist form language that shaped the design philosophy of the Bauhaus in Dessau. In contrast to the craft based, expressionist approach familiar from Weimar times, Bauhaus Dessau represented a factual, industrial design understanding. The focus of the design was functionality and the possibilities of affordable industrial production thus providing furniture for a broad spectrum of the population. With the advancement of the minimalist cantilever and the use of the, then, new material of steel tubing, the machine production was easy and efficient. Steel tube embodied in addition the aesthetics of a new era. With its cool radiance steel tubing replaced the mysticism and warmth of wood so familiar in furniture and so embodied the reforming character of modernity. 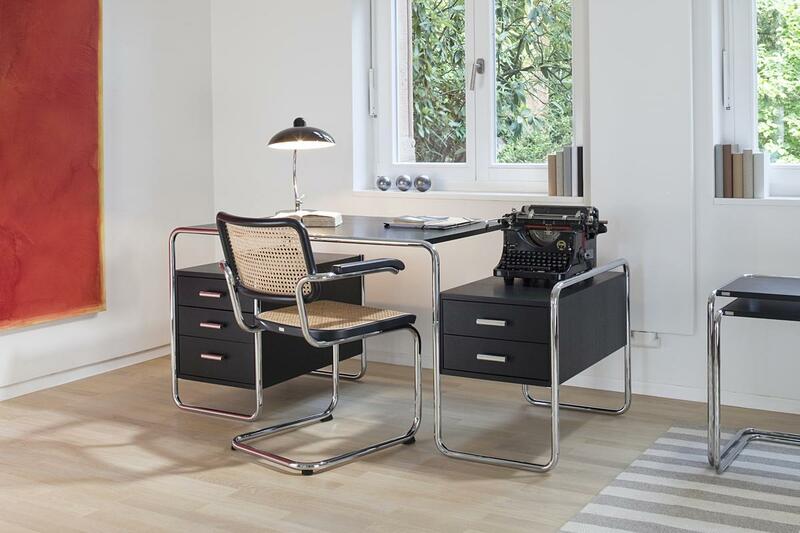 Although first through the closing of Bauhaus by the Nazis and the subsequent Second World War the mass production of steel tube furniture was a short lived phase in design history, Bauhaus tubular steel designs remain as contemporary and modern as ever. Born in Pecs, Hungary 1in 902 Marcel Breuer studied and taught from 1920 at the Bauhaus and even with hiss early designs had a significant influence on the design philosophy of the school. In 1928 Breuer departed Bauhaus and dissolved his company "Standard Furniture", handing over the rights of his furniture the company Thonet. In the following years Breuer was mainly active as an interior designer in Berlin until in 1935, on account of his Jewish ancestry, he was forced forced to emigrate, first to Hungary the London and subsequently United States. From 1937 Marcel Breuer worked as a lecturer and professor at the "Graduate School of Design" at Harvard University. In addition Breuer and Walter Gropius, founded an architectural firm in New York before in 1946 Breuer set up on his own. In the following years he worked exclusively as an architect and realised numerous designs in Europe and the USA. 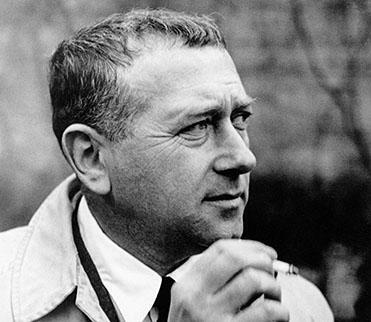 Marcel Breuer died in 1981 in New York. 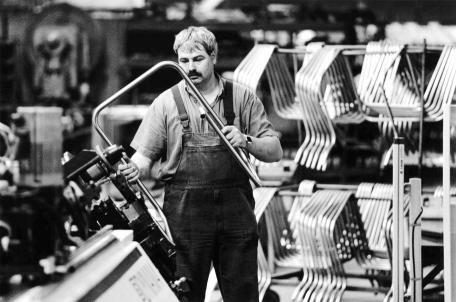 Thonet's production facility and corporate headquarters is located in the Germany village of Frankenberg / Eder. 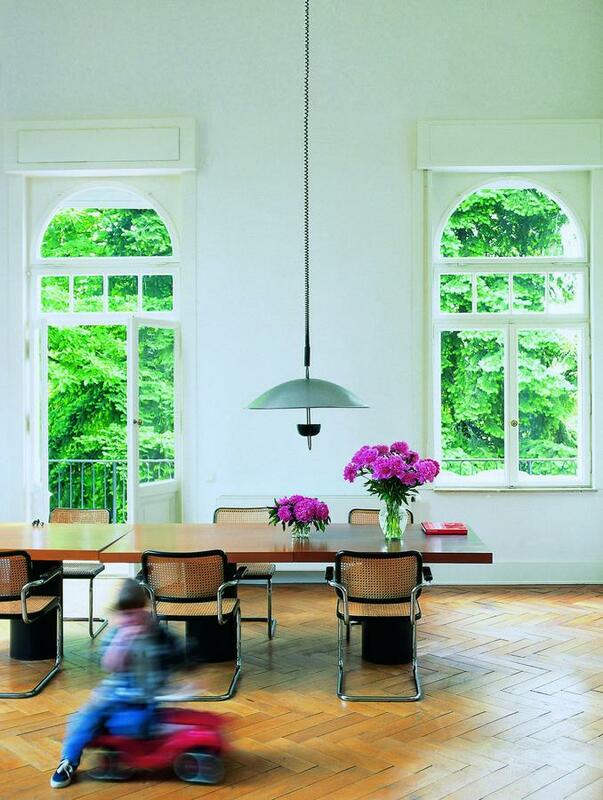 There Peter Thonet, a direct descendant of the founder Michael Thonet, directs the the family owned company. 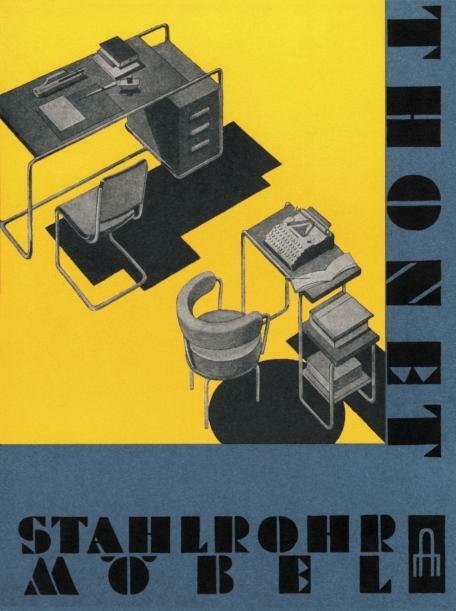 Michael Thonet had originally founded the company in 1819 as carpentry firm in Boppard am Rhein, Germany. In the following decades the company quickly developed into a globally active concern, largely because of the effortless way they combined innovative and completely new manufacturing technologies with equally innovative and new designs. This relationship is most evident in the bentwood chairs from the mid-nineteenth century and the tubular steel furniture from the 1920s. 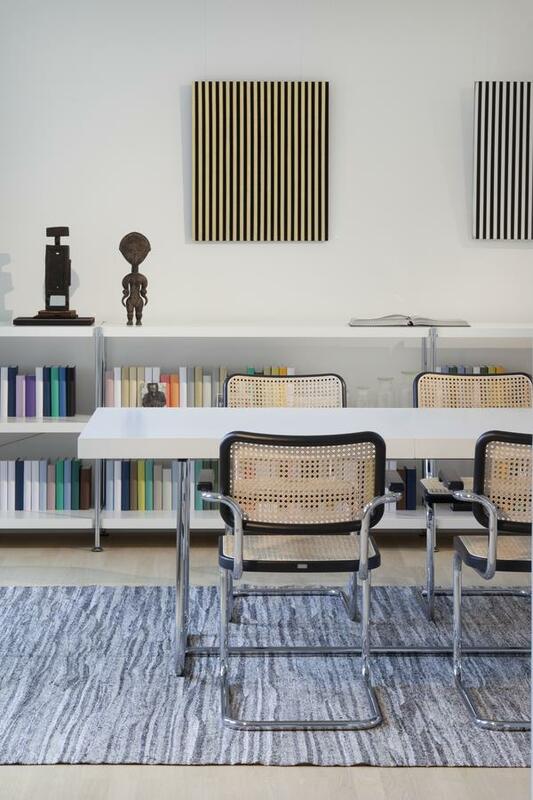 In both cases the novel fabrication method of the chairs made mass production possible while the designs set standards which remain as valid and contemporary as ever. 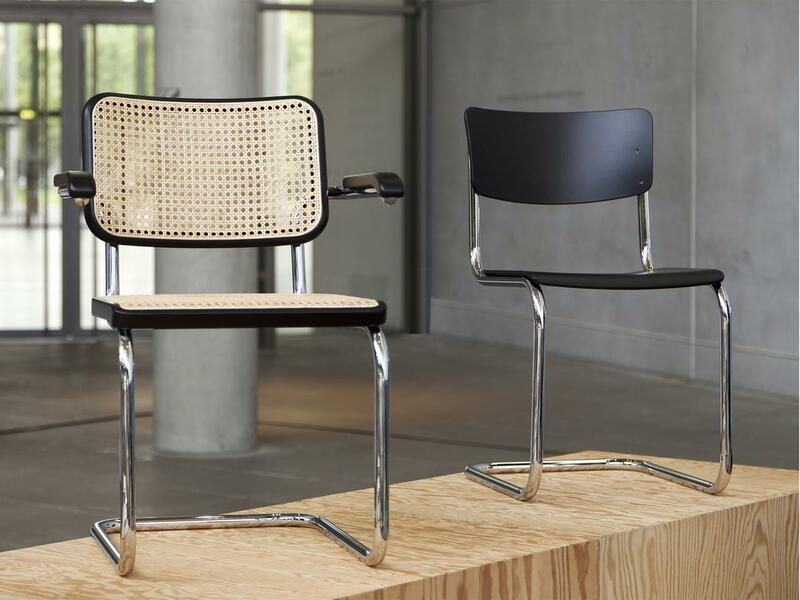 Because Breuer's tubular steel cantilever chair S 64, with its aesthetic combination of wood, steel tube connects to the bentwood chairs and so links the two main stages in the history the chair has a special place in the Thonet programme.